The best available facilities all over Hungary. Have a look at the information about each place and pick the one that fits your needs the best! Our swimming venues all offer excellent facilities for training in combination with amenities for an enjoyable group / team holiday. Just have a look at the pictures and decide which destination would fit your needs the best! Our partner, swimming coach Joseph Nagy, worked in the U.S. for 10 years with great success, coaching athletes like Mike Barrowman (Olympic Champion - 200m Breaststroke, Barcelona 1992), Roque Santos (Olympic Trials Champion, US Open Record holder and Senior World Record holder in 1998 in 100m Breaststroke) and Sergio Lopez (european record holder and US Open Champion in 1998 in 200m Breaststroke). 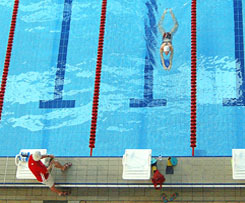 At present Nagy is coaching in the National Swim Center in Vancouver, Canada and his swimmer, Annamay Pierse, holds the world record in 200m Breaststroke. Nagy's knowledge in swimming, together with our experience in organizing training camps in Hungary, will assure you of impeccably organized and successful camps. ® 2011 Sport Camp Ltd, All rights reserved.